Our doctors perform many surgeries including, but not limited to spays and neuters, mass removals, dewclaw removals and many other procedures as needed. Our team takes every precaution to ensure that our patients receive safe anesthesia. Before surgery, we perform a preanesthestic exam and always recommend preanesthetic bloodwork to determine which anesthesias and pain medications are safe to use, as well as IV catheter placement all prior to anesthesia. During anesthesia, your pet will receive electronic monitoring of heart rate, ECG, temperature, oxygenation, blood pressure and personal monitoring. 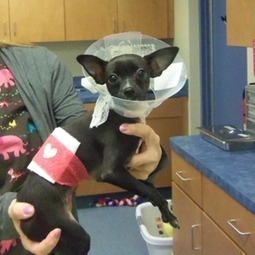 All pets receive pain management both during and after surgery. Post surgery there is always a medical staff member monitoring during recovery. We always want you to be comfortable with any procedure that is being done and are happy to discuss the procedure and answer any questions you may have both before the surgery is booked and after our patient has been discharged and is back in your care.